This is the third blog post in a series looking at an array of issues in 2019 related to weapons use, the arms trade and security assistance, at times offering recommendations. 2018, for some reason, was a turning point for international diplomatic recognition of gender dimensions of weapons and disarmament policy. After years or even decades—or in WILPF’s case, a century—of feminist advocacy for governments and activists to take gender into account in their work, we seem to breaking new ground. In March, the Permanent Mission of Canada to the United Nations in Geneva collaborated with WILPF, Small Arms Survey, and the Gender Mine Action Programme on a one-day training for disarmament diplomats about including gender perspectives in their work. In April, WILPF coordinated with the Canadian mission in New York on a meeting that brought together the women, peace and security (WPS) and disarmament diplomatic communities to exchange on the same subject. In May, UN Secretary-General António Guterres launched his new disarmament agenda, Securing our Common Future. It includes a section on “Ensuring the equal, full, and effective participation of women,” and there are several references throughout the document to the gendered impacts of weapons, gender-sensitive arms control, or women’s participation in disarmament, including urging states to incorporate gender perspectives in their national legislation and policies on disarmament and arms control. In June, the Third Review Conference to the UN Programme of Action on small arms and light weapons (UNPoA) adopted a report with groundbreaking references to armed gender-based violence, the gendered impacts of small arms, and women’s participation in disarmament. The document builds on gains made in 2012 and 2016 to alleviate the overall gender blindness of the UNPoA. The International Action Network on Small Arms (IANSA) Women’s Network coordinated input and advocacy amongst civil society groups and diplomats for the inclusion of these elements in the outcome document, including through the civil society Call to Action on gender and small arms control. 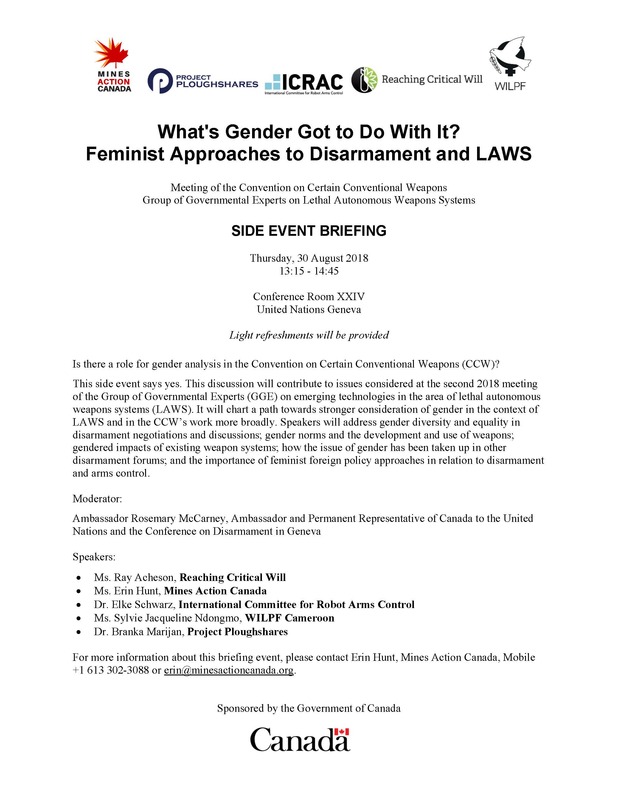 In August, the Convention on Certain Conventional Weapons (CCW) considered gender issues for the first time, in a side event hosted by the government of Canada, International Committee for Robot Arms Control (ICRAC), Mines Action Canada, Project Ploughshares, and WILPF on the relationship between gender and fully autonomous weapons. Participants addressed gender diversity and equality in disarmament negotiations and discussions; gender norms in relation to the development and use of weapons, gendered impacts of existing weapon systems; and the importance of feminist foreign policy approaches in relation to disarmament and arms control. Also in October, the Latvian ambassador, who will preside over the Fifth Conference of States Parties to the Arms Trade Treaty, announced that the conference and its preparatory meetings will focus on the gender-based violence provision of the Treaty as a special theme. This will provide an opportunity in 2019 to advance consideration of how to implement this aspect of the ATT, including using guidance and case studies published by groups like WILPF previously. In addition to these forum-based efforts, the UN Institute for Disarmament Research joined the governments of Ireland, Namibia, and Canada to form the Disarmament Impact Group as an output of the International Gender Champions. The Group aims to “support the disarmament community in translating gender awareness into practical action across the range of multilateral disarmament processes and activities.” Meanwhile, academic sources like Critical Studies on Security and the Oxford Handbook on Women, Peace and Security, news sources like The Nation, and public speaking forums from TEDx to the London School of Economics featured articles and talks about feminism, gender, and weapons. This has signaled an opening of academic and activist spaces for increased consideration of these issues. So, why has all this happened so quickly? In reality, it hasn’t. It is built on a firm foundation of activism and analysis. Feminist disarmament activists and academics, particularly those with groups like WILPF and the IANSA Women’s Network, have been writing and campaigning on gender and disarmament for decades. UN agencies and some governments have been working to mainstream gender in their programming for a long time, certainly since the adoption of UN Security Council Resolution 1325 in 2000. This has led to concrete outcomes at international disarmament diplomacy forums in recent years: the first UN General Assembly resolution on women, disarmament, non-proliferation and arms control in 2010; the inclusion of gender-based violence in the Arms Trade Treaty in 2013; the recognition of the gendered impacts of nuclear weapons and encouragement of women’s effective participation in disarmament in the Non-Proliferation Treaty Chair’s summary and the UN Treaty on the Prohibition of Nuclear Weapons in 2017. External factors are also at play. The #MeToo movement has arguably awoken new acceptability and credibility of previously hidden or shamed perspectives and experiences. Women, trans, queer, non-binary, and non-conforming folks, as well as men who have experienced sexual and gender-based violence have collectively created new spaces to amplify these realities and demand change. At the same time, several governments have begun pursuing what they term “Feminist Foreign Policy”. While it is debatable whether or not the foreign policies outlined by these governments can yet be truly described as feminist, it is a welcome development for government offices to be considering feminism not just a valid but an imperative approach to their international engagement. In disarmament forums, momentum certainly seems to be on our side. There is a growing acceptance among a diverse range of governments, international organizations, and civil society groups about the reality that weapons have gendered impacts, and that women’s participation in disarmament is important. This is good progress, and imperative to making change in this field. But it’s not enough. For one thing, the demand for women’s equal, effective, or meaningful participation—while necessary and welcome—is insufficient for truly making change in weapons policy. Our current situation is dire. Trillions of dollars are being spent on militaries and technologies of violence while poverty, inequality, and climate change threaten our collective security and safety. Disarmament, as a policy and practice that leads us away from militarism and towards peace, requires new understandings, perspectives, and approaches to weapons and war. It requires the effective and meaningful participation of survivors of gun violence, of nuclear weapons use and testing, of drone strikes, of bombardment of towns and cities. It requires the effective and meaningful participation of marginalized communities—LGBT+ folks, people of color, those at a socioeconomic disadvantage, people with disabilities. Diversity is not about political correctness. It is the only way we are ever going to see change in the way that we confront issues of peace and security. Where we have achieved the most disarmament progress in recent years—banning landmines and cluster bombs and nuclear weapons, for example—we have engaged with diverse communities and put humanitarian perspectives over the profits of arms industries or the interests of powerful governments. This is not just about including women, especially women who come from the same or similar backgrounds as the men who already rule the table. It’s about completely resetting the table; or even throwing out the table and setting up an entirely new way of working. Disarmament requires that we change the way we think about and confront war and violence as social and economic institutions, and we can’t do that just by giving some privileges to those who do not challenge the thinking or the behavior of those who have the most privilege. Diversity is not for its own sake, but for how it impacts what is considered normal, acceptable, and credible. Confronting norms, especially gendered norms, around weapons and war is imperative to making progress on disarmament. As a feminist disarmament activist, I have come to believe that more than anything else, the association of weapons with power is one of the foremost obstacles to disarmament. This association comes from a particular—and unfortunately, very dominant—understanding of masculinity. This is a masculinity in which ideas like strength, courage, and protection are equated with violence. It is a masculinity in which the capacity and willingness to use weapons, engage in combat, and kill other human beings is seen as essential to being “a real man”. This type of violent, militarized masculinity harms everyone. It harms everyone who does not comply with that gender norm—women, queer-identified people, non-normative men. It requires oppression of those deemed “weaker” on the basis of gender norms. It results in domestic violence. It results in violence against women. It results in violence against gay and trans people. It also results in violence against men. Men mostly kill each other, inside and outside of conflict. A big part of this is about preserving or protecting their masculinity—a masculinity that makes male bodies more expendable. Women and children, obnoxiously lumped together in countless resolutions and reports, are more likely be deemed “innocent civilians,” while men are more likely be to be considered militants or combatants. In conflict, civilian men are often targeted—or counted in casualty recordings—as militants only because they are men of a certain age. We are all suffering from the equation of violence and power with masculinity. It prevents those who identified as men from being something else—from performing gender differently. It prevents all of us as human beings to promote or explore strength, courage, and protection from a nonviolent perspective. It makes disarmament seem weak. It makes peace seem utopian. It makes protection without weapons seem absurd. The norm of violent masculinity will continue to cause suffering and reinforce inequalities until we get serious about doing something differently. This is a project of dismantling the patriarchy, which is a big project, but it starts with the language we use, the people we include in discussions, and the norms we are willing to challenge. For 2019, let’s stop using the term “women and children”. They are not the same legally or politically. They have different needs and abilities. Let’s talk about the different impacts of weapons based on gender and age, instead of womenandchildren on one side and men on the other. Let’s talk about gender diversity in disarmament, instead of just the equal participation of women and men. Let’s get away from binary language to something more inclusive. Let’s also include survivors and those impacted by weapons, war, and violence. Let’s think about what we consider credible or powerful, and why we think that way. As more and more governments and organizations become interested in taking up gender, and as feminists around the world from all walks of life smash down barriers outside the disarmament field, let’s not waste the opportunities ahead of us. An intersectional feminist approach to disarmament is imperative, and we have all the tools we need to achieve it. Over the past two decades, an approach now termed “humanitarian disarmament” has had increasing success in creating multilateral instruments that ban some of the world’s worst weapons, most notably landmines, cluster munitions, and nuclear weapons. At first glance, treaty-making would appear to have little relevance to non-state actors, who functionally have rejected the authority of their state. Yet, the humanitarian disarmament approach, when perceived more broadly and examined more closely, has had and continues to offer lessons for addressing non-state actors. The key is reframing the discussion as being about human security and using the power of civil society-led initiatives to create change. This short essay looks more closely at efforts to: (1) convince armed non-state actors to abide by international agreements (namely the Mine Ban Treaty via deeds of commitment); (2) end production of banned weapons (primarily via the Stop Explosive Investments campaign related to cluster munitions); and (3) stop weapon creation by pre-emptive efforts led by scientists, industry and others (as relates to killer robots). While these three treaties are the best-known examples of the humanitarian disarmament approach, additional efforts are ongoing to address current and potential future use of weapons in indiscriminate ways. For example, the International Network on Explosive Weapons (INEW) is working to tackle the use of weapons with wide-area effects in populated areas because they inflict instant and ongoing human suffering. As the name suggests, the Campaign to Stop Killer Robots seeks to prohibit autonomous machines from being developed and used, highlighting the dangers of lethal weapons that act without human control. And the Control Arms campaign, in continuing to promote effective implementation and universalization of the Arms Trade Treaty, focuses on addressing the humanitarian harm caused by the arms trade. From a traditional security perspective, directly approaching armed non-state actors can be dangerous and is always fraught with the challenge of appearing to take the side or assessing the validity of an actor’s deeds. From a human security perspective, however, there is value in making sure that armed non-state actors behave as responsibly as possible. Educating and attaining commitments from armed non-state groups can in some instances prove possible and useful. This effort and other similar ones, while controversial, are examples of how the humanitarian disarmament approach to promotion of international agreements can have relevance to and impact the actions of non-state actors (as well as states). Using financial pressure to change behavior is, of course, not unique to humanitarian disarmament campaigns. But approaching human security challenges with these tools in mind brings recent developments on gun control efforts in the United States into new focus. In the wake of the outcry and advocacy after the February 2018 student shooting that killed 17 people at Marjory Stoneman Douglas High School in Parkland, Florida, many major financial institutions, stores, and other non-state entities took measures that stopped the sale of assault-style weapons, barred gun-purchasing transactions, cut ties to the National Rifle Association, or took other actions that broadly supported gun control. [vi] This apparently spontaneous effort indicates the power of treating a weapons-related issue from a human security perspective and building financial and other pressure to convince non-state actors (broadly defined) to act differently. Unlike nuclear weapons, they require no costly or hard-to-obtain raw materials, so they will become ubiquitous and cheap for all significant military powers to mass-produce. It will only be a matter of time until they appear on the black market and in the hands of terrorists, dictators wishing to better control their populace, warlords wishing to perpetrate ethnic cleansing, etc. High profile signers of the letter, such as Elon Musk and the recently deceased Stephen Hawking, bring international attention to the topic. [viii] The issue is also raised among the global industrial elite, such as at annual World Economic Forum gatherings in Davos. Recently, national open letters signed by AI experts, in places such as Australia, Belgium, and Canada, have called on their governments to support a ban on killer robots. A fictional video depicting these concerns, “Slaughterbots,” produced by a professor at the University of California now has had more than 2.5 million views on YouTube. [ix] In April 2018, more than 3,000 Google employees signed a letter opposing work on weapons after learning about Google’s involvement in AI technology that could improve drone targeting,[x] and controversy erupted at a South Korean university over possible collaboration with companies to make killer robots. [xi] Ultimately, actions being taken by civil society, including among those who could be responsible for creating killer robots, are building a stigma against the weapons and could serve to pre-empt their use even before states decide exactly what they want to do. A key lesson to learn from these diverse examples is to rethink the challenge of non-state actors. While state-based activity has its place, so too do efforts by civil society-led initiatives that directly engage or impact upon non-state actors, some armed and some responsible for producing arms. The creative work being done in support of humanitarian disarmament is grounded in concern about human security, which is often a better lens for thinking about security challenges. Many successes have been made to date, and a diverse array of approaches continue—all meriting greater attention and support. Jeff Abramson manages the Landmine and Cluster Munition Monitor for the ICBL-CMC (International Campaign to Ban Landmines-Cluster Munition Coalition), is a non-resident senior fellow at the Arms Control Association, and coordinates the Forum on the Arms Trade. [i] See the latest editions of the Landmine Monitor and Cluster Munition Monitor for details on the use of these weapons, casualties caused by them, assistance to victims, clearance of contaminated land, and other related information, www.the-monitor.org. [ii] “Deed of Commitment” and “Armed Non-State Actor” webpages found under the “How we work” section of the website, Geneva Call. [iii] “Worldwide Investments in Cluster Munitions: A shared responsibility.” PAX, May 2017. The Stop Explosive Investment website details more recent developments, including: “Japanese companies divest from cluster bombs” December 2, 2017; and “Italy bans investments in cluster bombs producers,” October 4, 2017. Note, a similar report, “Don’t Bank of the Bomb,” first published in 2013 uses the same approach to identify investments in nuclear weapons production, and now supports the new Treaty on the Prohibition of Nuclear Weapons. [iv] Textron spokesperson reconfirms that it will not make cluster munitions in John Ismay, “U.S. Will Keep Older Cluster Munitions, a Weapons Banned by 102 Nations,” New York Times, December 1, 2017. [v] “Modernizing the U.S. Munitions Arsenal,” Government Business Council, underwritten by Orbital ATK, March 2018. [vi] See for example: Brad Tuttle, “All the Companies Cutting Ties With the NRA After Deadly Florida School Shooting” Time, March 1, 2018; Kate Taylor, “Here are all of the retailers that have stopped selling assault-style rifles and changed firearm policies following gun-control activists' protests,” Business Insider, March 2, 2018; Stacey Samuel, “National Teachers Union Cuts Ties With Wells Fargo Over Bank's Ties To NRA, Guns,” National Public Radio, April 20, 2018. [vii] Find a list and recap of latest meeting at “Convergence on retaining human control of weapons systems,” Campaign to Stop Killer Robots, April 13, 2018. [viii] “Autonomous Weapons: An Open Letter From AI & Robotics Researchers,” Future of Life Institute. [ix] An overview of these and other developments in 2017 is found in “National campaigning against killer robots,” Campaign to Stop Killer Robots, December 7, 2017. [x] Scott Shane and Daisuke Wakabayahsi, “‘The Business of War’: Google Employees Protest Work for the Pentagon,” New York Times, April 4, 2018. [xi] David Gilbert, “A South Korean university is building killer robots — and AI experts are not happy,” VICE News, April 5, 2018.